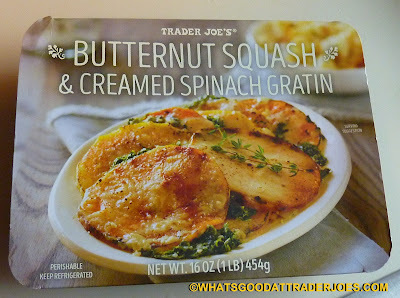 Unable to procure the popular, recently-released Butternut Squash Mac & Cheese, reviewed by my esteemed colleague, Sonia and I chose this interesting dish on our last TJ's run. 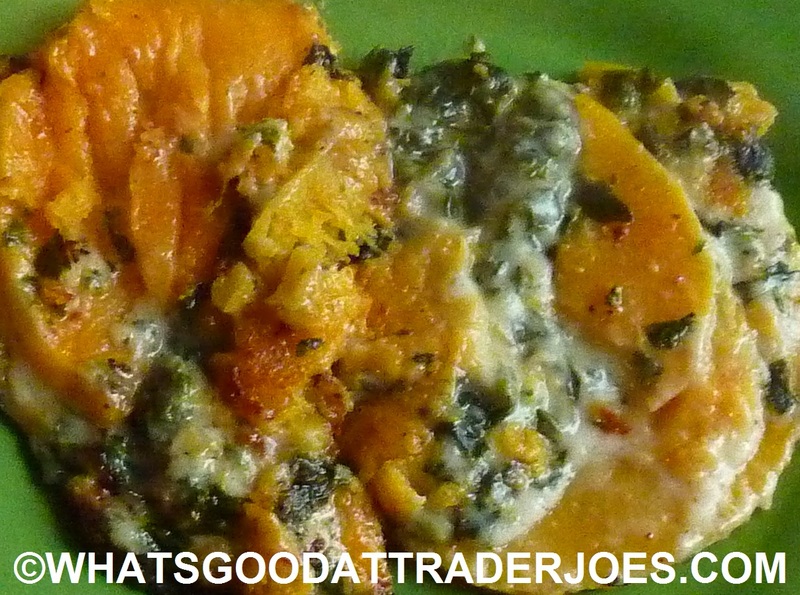 It's slightly reminiscent of another understated Trader Joe's find from two years ago: Butternut Squash Parmigiana. The main difference, of course, being that the parmigiana was significantly sweeter...and also "ovenable." This product is microwavable. No other heating instructions are given, although Sonia and I will now assert that it is indeed "stovetoppable." At the moment, Sonia and I are sans microwave yet again. Well, okay, I take that back. We still have a microwave, but it's in our RV, and I wasn't about to fire up the generator on Tiago the Tioga just to heat our lunch. So we tossed this refrigerated—not frozen—food item in a skillet and stirred it around until heated evenly, and the whole thing worked out beautifully...or at least deliciously, anyway. Sonia immediately mentioned that the product lacked "sauce." I think she was talking about the creamed spinach...as well as the parmesan cheese? 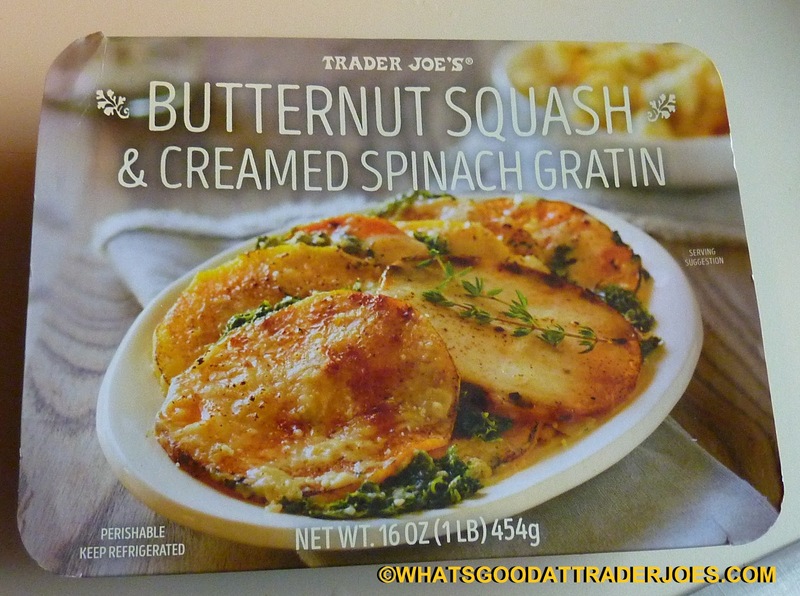 I thought there was plenty of creamed spinach, but I guess our chosen method of preparation kind of ruined the "gratin-ness" of the dish. Since we didn't microwave the product, I'm guessing we just stirred all the browned, grated cheese right into the rest of the foodstuffs. Flavor-wise, it worked, although the presentation might have suffered a bit as a result. Eh. We were both hungry, so we wouldn't have spent very long gawking at the dish before shoveling it into our mouths anyway. You're lucky we paused to take a picture at all. Sonia also asserted her absolute approval of the trio of flavors here: butternut squash, spinach, and parmesan cheese—she just wanted a tad more spinach and parmesan. I concur that the flavor combo worked on some level, but I felt that the subtle natural sweetness of the squash worked better with amaretto cookie crunch in the aforementioned parmigiana, and that elements like spinach and parmesan cheese mix better with salty, savory vegetable dishes, such as the classic potatoes au gratin. Sonia liked that it walked the line between savory and sweet, whereas I generally prefer one or the other. And it's always possible my palate's a little off, or that I'm going insane, but I thought the butternut squash in this instance in particular, was unusually sweet. No biggie. I still give it a solid three and a half stars and think most butternut squash fans will like it. Sonia gives it a full four. Sounds promising! Kudos on your resourceful reheating. 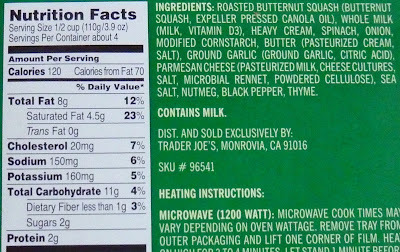 I would love to see more feedback on portion size when you review products- TJs stuff seems to vary a lot on how generous a portion is. Would this really make a side dish for four people...?? Looks like a great last minute dish, especially since it takes a long time to bake something like this making it yourself. Yeah...in theory this could be a SIDE dish for four. There were about 5 or 6 "slabs" of squash in the package. I really want to like this but the thought of slabs of butternut squash don't appeal to me LOL. Maybe if it had some more spinach and Parmesan. I was at Trader Joe's tonight and they were sampling the new Bamba peanut snacks. Oh my gosh these things are so addicting you have to do a review on them. As the person sampling said you eat the first few and you're like eeehh. But then on the third or fourth one you become strangely addicted. this is apparently in an Israeli snack that is incredibly popular. It only has four ingredients- peanut paste corn grits palm oil and salt. 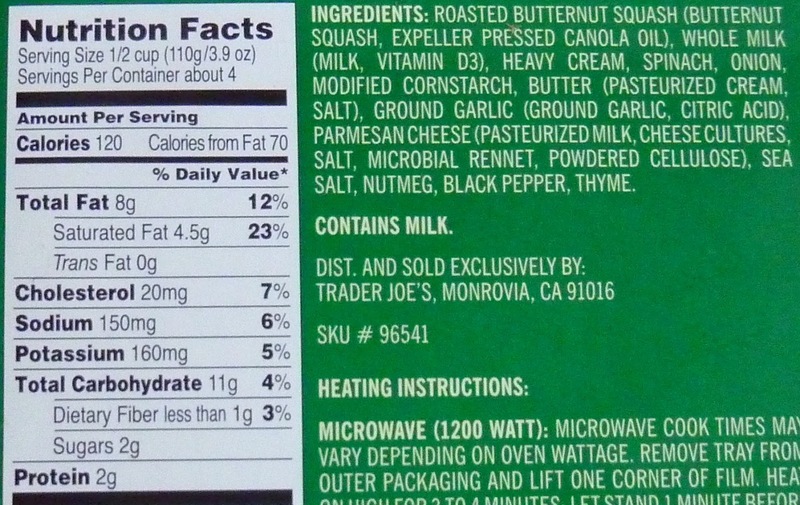 Almost no sugar and low sodium. Sort of imagine puffed cheese snacks without the cheese and peanut butter instead. You can eat 40 of these for only 160 calories and it only has less than 1 gram of sugar and 2 grams of fiber. I can imagine those with children it would be a relatively healthy snack.